As 13th begins, the screen is black with the voice of President Obama explaining that the United States has 5 percent of the world’s population, but 25 percent of the world’s prison population amounting to 2.3 million prisoners, the highest in the industrialized capitalist world. Ava DuVernay’s new documentary chronicles the rise of mass incarceration in America, in many ways using Michelle Alexander’s, best-selling and highly recommended book, The New Jim Crow, as a blueprint. The film’s title and starting point are the 13th amendment to the US Constitution, which formally ended the system of slavery after the Civil War. The amendment states, “Neither slavery nor involuntary servitude, except as a punishment for crime whereof the party shall have been duly convicted, shall exist within the United States, or any place subject to their jurisdiction.” [italics added] This “loophole” retained for servitude of prisoners came to be prophetic in pointing toward the future development of a mass incarceration state, particularly for black Americans. The release of 13th comes during a crucial moment in U.S. politics with the rise of Black Lives Matter (BLM), the development of prisoners’ strikes around the country, and the racist attacks soon to come from the right wing Trump administration. “Put simply; this is the era of the prison industrial complex. The prison has become a black hole into which the detritus of contemporary capitalism is deposited. Mass imprisonment generates profits as it devours social wealth, and thus it tends to reproduce the very conditions that led people to prison.” – Angela Davis, Are Prisons Obsolete? Nixon’s “law and order” and “war on drugs” policies sought to dismantle the radical movements, in part by implementing a social control doctrine that included mass incarceration as well as the direct and violent intervention of state forces as with the program of “Cointelpro”. Unfortunately, 13th does not adequately take up the Democratic Party’s complicity in the historic process of building the mass incarceration system, including the setting of the stage for the new policies by Presidents John F. Kennedy and Lyndon B. Johnson. Elizabeth Hinton, author of From the War on Poverty to the War on Crime, explains JFK’s role: “Kennedy’s creation of the President’s Committee on Juvenile Delinquency and Youth Crime in the Spring of 1961 began a series of direct government interventions in cities with high concentrations of black citizens” (p.12). Prison became a space for the warehousing of working-class and poor people left behind by neo-liberal capitalism, emerging increasingly as a form of social control for disposable surplus labor. It was this key element that ushered a new paradigm for institutionalized racism under American capitalism that influenced public policy and consciousness, while destroying the lives of working and poor people, and particularly youth of color. Ronald Reagan continued from where Nixon left off, increasing militarized law enforcement and further developing Nixon’s “War on Drugs” into a broad and entrenched war on working, poor, and people of color. The “Just Say No” to drugs campaign spearheaded by First Lady Nancy Reagan was offered as a simple “pull yourself by your bootstraps” solution to the deeper structural racism and impoverishment facing black America. Racism does not just exist, it is a fire that is stoked. In 1988, George H.W. Bush’s campaign used Willie Horton and the image of the terrifying “Black menace” to paint his opponent, Democrat Michael Dukakis, as “soft on crime” – a tactic that may have helped him win the election. This racist trope was used to paint black people as a population that needs to be controlled and brought to heel and was successful in invoking fear and division among a section of middle and working class people. The ascendancy of Bill Clinton and the “New Democrats” of the early 1990s was a turn to the right by the Democratic Party. Clinton took up the “tough on crime” rhetoric of Bush and Reagan, and advanced some of the most conservative legislation against working people and people of color in recent memory. The passage of the 1994 omnibus crime bill accelerated the horrific increase of the prison population, particularly with the insidious mandatory-minimum sentencing for nonviolent drug offenses. The lives of some of the fastest growing populations in the prison system – women of color, trans people, and the poor – unfortunately receive little attention in 13th. The stories of Sandra Bland and Marissa Alexander are not told, for example, and the film’s narrative is mostly black-male centered. Equally problematic is the balance of the 38 pundits, scholars, and commentaries in the film. While the voices of leading thinkers and activists against the mass incarceration state like Angela Davis, Michelle Alexander, and Khalil Gibran Muhammad are appropriately highlighted in the film, the film also uncritically includes conservative voices like Newt Gingrich and Grover Norquist, who enormously advanced the neoliberal agenda and pushed the “law and order” rhetoric. Establishment liberal black pundits and politicians like Charles Rangel, Van Jones, and black technocrat Congressman and former Mayor of Newark, Cory Booker, are allowed to appear as sound voices of indignation against the mass incarceration state and the conservative agenda of the Republican party. However, Charles Rangel, Cory Booker, and other leaders in the black establishment were willing participants in creating the conditions that produced this brutal reality for working, poor, and people of color. What is also missing is a closer examination of the state of global capitalism that contributed to the rise of the mass incarceration state. 13th misses the significant development of the economic crisis of 1973-75 that saw the end of the post-World War II economic upswing and emergence of neoliberal capitalism. What followed was a massive transfer of wealth to the top from the bottom, a greater financialization of the market, the undermining of the manufacturing and textile industries, and the militarization of police. In this period, communities of color were faced with greater joblessness, underfunded education, and dilapidated housing, all of which created rising levels of despair. The industry of prison construction and warehousing for idle labor and criminalized youth, poor and people of color has become a booming and profitable business. Folks like Van Jones, or even Angela Davis, while critical of the overt policies of incarceration, fail to get at the root of the problem by providing an assessment of capitalism and the underlying systemic causes of the mass incarceration state and racism itself. 13th does provide a snapshot of the private prison industry and the role of the American Legislative Exchange Council (ALEC), the Republican party political and legislative think tank that was integral to the “Stand Your Ground” laws in Florida and other states. But once again 13th shines a light on the crimes of the Republican Party while the Democratic Party largely receives a pass. In reality the Democratic Party are in the leadership in the cities where the bulk of the black population lives and have energetically implemented mass incarceration and privatization of prisons as part of the neo-liberal agenda, using these policies to reward their partners on Wall Street. Meanwhile the bipartisan failure to support federal or state programs needed to restore the citizenship and humanity of formerly incarcerated people – like housing, jobs, and education – is utterly shameful. 13th‘s release takes place at a crucial stage for American capitalism and in the re-emergence of social movements. As Donald Trump enters the White House, there are ongoing crises within both parties of big business, a radicalization in society among workers, youth, and people of color against capitalism and its tools of racism, sexism, xenophobia, and homophobia. 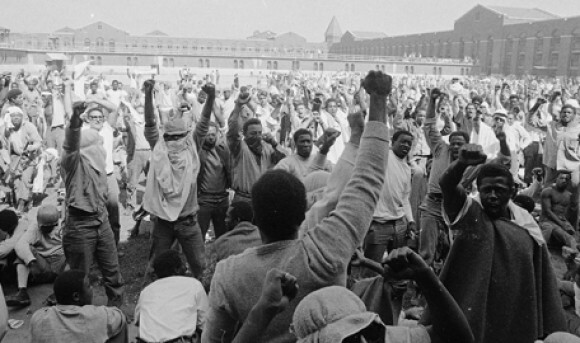 13th introduces workers, youth, and people of color to the effects of mass incarceration on our communities, telling its stories in a clear and graphic manner in the long march of daily capitalist oppression and violence. 13th has an element of a marketing ad campaign in support of the Democratic Party, even as the emergent movement against mass incarceration, Black Lives Matter, has challenged Democratic Party leaders and the black political establishment. 13th‘s uncritical inclusion of enemies of the BLM movement like Gingrich, and Democratic party liberals and apologists like Rangel and Booker, and failure to expose the complicity of the Democratic Party in the history of institutionalized racism, only serves to again prove the necessity of ending the abusive relationship with the Democratic Party and its associated misleaders. It is time to gather the forces required to fight back against Trumpism and Wall Street, bringing together the wider working class. We need to run our own independent working-class and BLM candidates on a program that put workers, youth, and oppressed people’s needs first rather than catering to the super profits of Wall Street. Despite its weaknesses, 13th does bring an understanding of the rise of the mass incarceration state to a wider audience, providing a visual narrative of the enormous human costs of this feature of modern American capitalism. 13th allows ordinary working people to bear witness to the cruel warehousing of human beings – the victims of indifference, poverty, racism and benign neglect – and understand the scale of inhumanity taking place. Ending racism and incarceration demands a new vision of society based on human need, cooperation, and solidarity. A new generation of young people, inspired by Black Lives Matter, are increasingly questioning capitalism and the rule of Wall Street, and searching for an alternative to this racist system. Next articleOakland’s Ghost Ship Fire: Who’s Really to Blame?